I have always told folks I’m not a true hobbyist. A true hobbyist is someone who builds a model plane, boat, train layout, doll house, etc. from scratch. That doesn’t mean that someone without building experience can’t be involved in hobbies. A lot of today’s cars, trucks, airplanes, helicopters, boats, drones and even rockets come ready to go out of the box. That also doesn’t mean that somewhere down the line the buyer won’t have to repair something. That is when they become a hobbyist. Before I was a hobby shop owner, I rode motorcycles for about 30 years. For the last 20 years of that period I raced motorcycles, first on tracks, and for the final 15 years specializing in motorcycle hill climbing. I even opened a small motorcycle shop. At Christmas in 1985 my wife and daughter gave me a radio controlled car kit. I started to build the kit, got into a little trouble, and needed some help to finish it. When it was finished I drove it around and couldn’t believe how much it was like running a real race car. In the summer of 1986 I entered my first race at a track in New Jersey. I was pretty cautious in the first minute, only running at about half speed. As the race went on I hit the throttle harder until, with less than a minute left, I heard announcer say I was in the lead. I managed to stay in the lead and won. I was hooked! 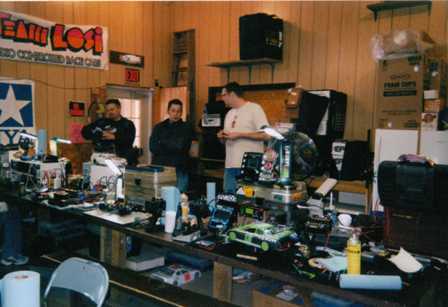 I went to some more races that summer and even ran a few indoor carpet races in the fall. In the winter of 1986/1987 my wife and I discussed adding R/C cars and trucks to our line of motor cycles and accessories. We contacted several distributors and finally found one who would work with us. In the spring of 1987 we purchased 4 Tamiya kits, 4 radio kits, 4 batteries, 4 chargers, and some parts. We decided to really get the sport going we needed a track. During the spring and early summer we built a dirt track behind our store. Our first race in July of 1987 drew all of 8 entries. We started running every Saturday night and by fall we were drawing 50 entries on a regular basis. The motorcycle shop was history. For the first two winters we rented various halls and continued to race on all kinds of surfaces. We put on races at fairs, block parties and anywhere we were invited to do so. We finally decided that we needed somewhere permanent to race all year round. In 1989 we had a 6,000 square foot building put up and started running indoor races on carpet. In 1993 we had the dirt track leveled and paved. We continue to race on both tracks. We had a dirt off-road track for 10 years but finally closed it because it was just too much work. A few years ago we introduced something new to the R/C racing world. We sponsor a R/C hill climb. This is not rock crawling, but a true speed event on a specially prepared 200 foot long hill. We don’t know of anyone else that does this. We run two events on the hill, in September. In the summer of 1987 a couple of model plane flyers mentioned that we had a good spot for a flying field. With their help, we laid out an area and proceeded to keep it mowed. It took a few years to develop the field fully but in 1992 the Beach Lake Aero Modlers Club was formed and soon became a chartered member of the Academy of Model Aeronautics (AMA). We lease the field to the club and keep it mowed and roll it in the spring. The field is still in use during the spring, summer and fall. It is open only to club members and their guests. Anyone interested in flying and belonging to the club, please contact us. We will tell you who to get in touch with. What started out with a few cars has expanded into other fields. We still carry R/C cars and trucks but we have added plastic models, rockets, boat, planes, the new drones, and even some trains. We also carry parts, accessories, paints, glues, etc. We deal with the top distributors and manufacturers in the business. If we don’t have something in stock, we can usually order it. We normally order from our major suppliers on a weekly basis. Both my wife and I are getting along in age but we hope to be here for some time yet.